Captain Ben caught his first fish when he was four years old on his grandfather's fly rod. He has been fishing since then for any fish that he can - saltwater or fresh - he loves them all. Ben grew up in Michigan, and spent all of his summers in the northwestern part of the state chasing smallmouth and salmon. Ben feels equally comfortable with either conventional or fly gear, and is an experienced guide that can accommodate any preferences a client may have. Ben is a fully licensed US Coast Guard Captain and a certified IGFA Captain. He loves to teach what he has learned over the years and he continues to learn every day, both from the fish and from the anglers that share his boat. As a former professional chef, it is Ben's belief that on the water, as it is in the kitchen, details are everything. 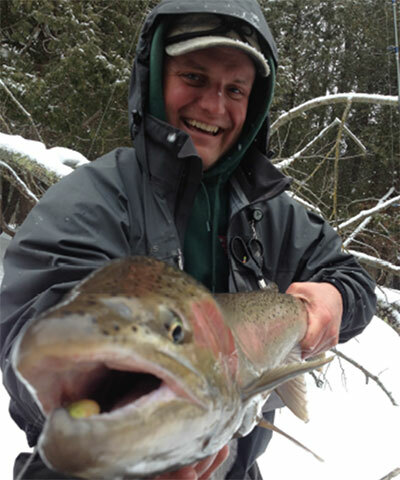 Chad grew up in Benzie County, fishing its beautiful streams and rivers in the area for steelhead, salmon, and trout. 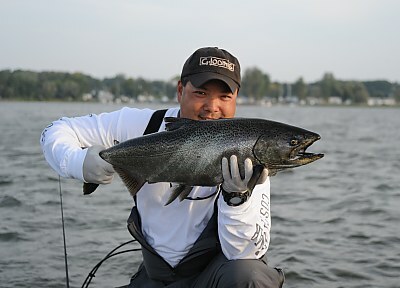 He refined his techniques on the Big 3 rivers in northern and lower Michigan. 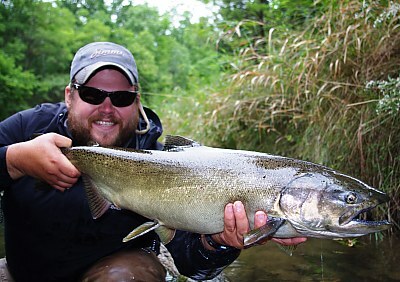 Primarily fishing with traditional gear, Chad has enjoyed fishing on the Great Lakes for salmon, steelhead, lake trout and browns for the past 11 years as an angler and guide and much of that time also as a licensed Captain. Each year, Chad enjoys two great northern Michigan traditions: he provides guide services for whitetail deer and spends the late fall and winter in pursuit of salmon and steelhead. 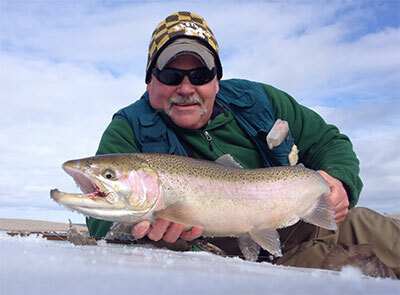 In the spring and summer, he enjoys setting lines on Lake Michigan for salmon and trout, allowing him the great opportunity to pursue multiple species in numerous environments. Chad's passion is having fun in the outdoors, and he particularly enjoys having the opportunity to share his experience with clients. With a great demeanor and personality, Chad is ready to guide Wolfe Outfitters' customers on their next fishing adventure. Coupled with his Captain's license, Chad's ability to fish the area rivers and navigable waters opens up many fishing options for our customers. 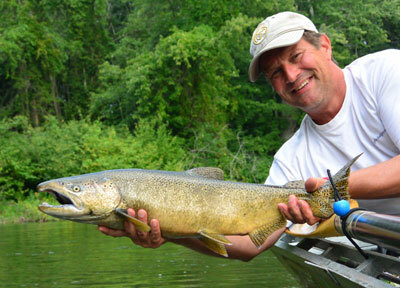 Jeff is a life-long fly fisherman, fly tier, and accomplished fish carver. He has recently retired from the U.S. Coast Guard and has lived and fly fished across the country - extensively throughout the Great Lakes and Alaska. He lives in Frankfort, Michigan, with his wife Diane. Jeff has in-depth of knowledge of both the Betsie and Platte Rivers, but is equally comfortable on the Manistee River and countless other waters in northern Michigan. Whether its trout, migratory salmon, and steelhead, or warm-water species in our area waters, Jeff loves chasing them all. He especially enjoys introducing people to the sport of fly fishing and is a Wolfe Outfitters fly fishing clinic instructor. Scott is a teacher both on and off the water. When not in the classroom you will find him on one of the many Northern Michigan lakes or rivers. Scott's passion for fishing began as a boy, fishing with his father on countless nights in Southern Michigan chasing bass with top water baits. When Scott met his wife Christine, from Northern Michigan, he expanded his passion of fishing to the fly and the pursuit of trout. For the last 20 years Scott has been a fly fishing junky. His biggest excitement in fishing is to see or hear a fish explode on a dry fly or top water bait. Scott has had the great fortune to fish many of the legendary fly waters in the country and has a strong passion for learning and teaching. He has had the opportunity to fish with a lot of great teachers and enjoys passing on what others have given to him. He particularly likes working with young anglers or people new to the sport; because of the genuine excitement people get when they are new to hooking and fighting fish. Scott prefers to wade the rivers he fishes, but is equally comfortable running the drift boat or guiding out of his bass boat on local lakes. 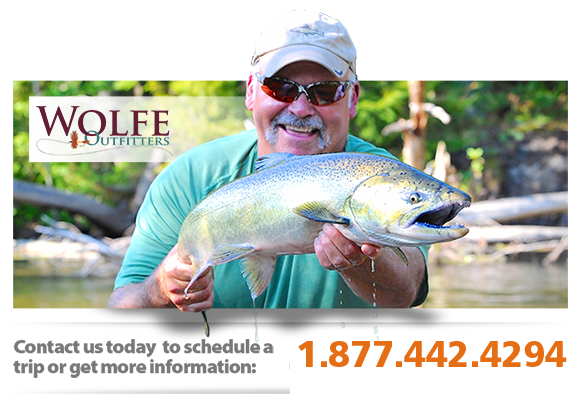 Scott looks forward to making your Wolfe Outfitters trip a memorable one. Matt grew up with a fishing rod in his hand chasing pretty much anything with fins. He ran a fly shop for several years before becoming a full-time fishing guide on the Pere Marquette River. He now guides for Wolfe Outfitters on the Manistee, Betsie, Platte, and Pere Marquette Rivers. Matt prefers to fly fish - mousing for brown trout on hot summer nights and swinging flies for steelhead in the fall are his two favorite things - but he will confidently pick up a spinning rod when it's called for. He absolutely loves casting Thundersticks for fresh king salmon. Matt is also a writer and has published several articles in The Drake, American Angler, and Michigan BLUE, and has published chapters in two books: Beer and Philosophy and Pulp Fly Vol.1.